Honoring our Nation's Colors is a cherished tradition practiced by our military and veterans. John Lyon VFW Post 3150 proudly offers Color Guard services to any event or group who wishes to take part in this time honored display of patriotism and Americanism. Our Color Guard is comprised exclusively of veterans of the wars in Iraq, Afghanistan and the Global War on Terrorism and is guaranteed to impress. If you would like to make a request for our Color Guard to make an appearance at your next event, please click the button to fill out the form bellow and we will make every effort to get you on our calendar. 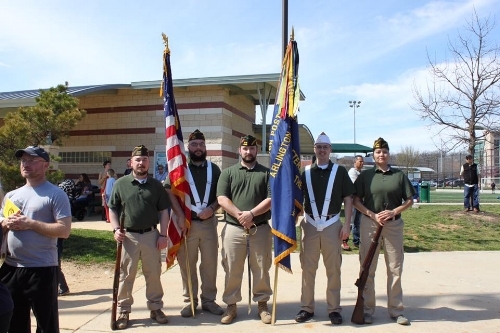 While we will consider and attempt to make every event, we do request that you provide at least one month's notice so that our all volunteer Color Guard can make time in their individual schedules to accommodate your request. Your request has been submitted. Someone will get back to you as soon as possible.